In this lab, you will create an Alexa skill called Bootcamp Assistant. The Bootcamp Assistant skill guides conference attendees by giving information such as breakfast/lunch time, directions to a meeting room, and whether a particular meeting room is on a floor. You will create the skill using the Amazon Alexa Developer Console. You will sign in to the console, create a new skill, define the necessary utterances, intents and slots and test the skill using the Alexa Simulator. The Bootcamp Assistant skill has an AWS Lambda backend. The Lambda function contains all the code necessary for the intents. You will front some of the Lambda functions of the skill with Amazon API Gateway APIs. The data for the skill is stored in a DynamoDB table. In the last task of this lab, you will create an Amazon Sagemaker Notebook and train the model with sample data. The model will then be able to predict activities for the skill user. All of the backend components such as the Lambda functions, the DynamoDB table, and some of the API Gateway APIs are being created as a part of your lab setup. You will be given instructions to review the code at the appropriate locations in the lab. You will also be given instructions to configure the necessary variables and run the scripts to set up the backend components. Log in to the Alexa Developer Console and define custom slots and intents. Create an utterance that uses the defined slots and intents. Create and integrate a Lambda function that backs an Alexa skill. Integrate your skill with APIs. Create an Amazon SageMaker notebook instance. Create an Amazon SageMaker machine learning model. Run a real-time prediction using Amazon SageMaker endpoint. Success logging into the Amazon Developer Console. Access to a notebook computer with Wi-Fi, a working microphone and Microsoft Windows, Mac OS X, or Linux (Ubuntu, SuSE, or Red Hat). An SSH client such as PuTTY. Familiarity with basic navigation of the AWS Management Console and comfort with editing scripts using a text editor. In this task, you will create an Alexa skill called Bootcamp Assistant and add intents to the skill which will give you information about breakfast/lunch time and whether a particular meeting room exists on a floor. You will also create and integrate the backend Lambda function for the skill. The task is divided into sections with step-by-step instructions. Below is a high level diagram of the task. 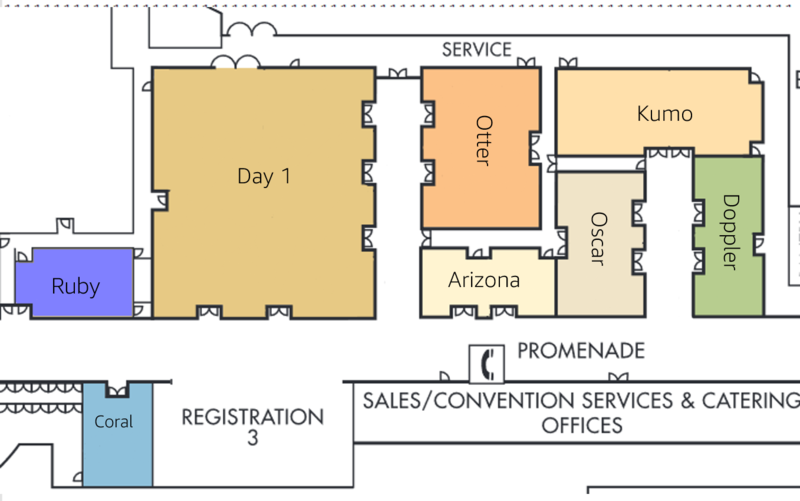 Below is the sample map of the meeting rooms used for this lab. Click Sign In at the top right corner. Log in using your Amazon.com account credentials. At the top left of the screen, click Skill Builders. On the Choose a template page, select Start from scratch and click Choose. At the top of the screen, click Save Model. Click Create custom slot type. For Slot Values, enter the values below one at a time. Click the button in the text box for each value. In the list of slot values you just added, locate the Registration row add the below synonyms under the SYNONYMS (OPTIONAL) column one by one and click the button for each synonym. For Sample Utterances, add the following one by one. Click the button in the textbox for each utterance. Bonus: Following the same pattern, add any other utterance you feel appropriate. Scroll down to Intent Slots. In the Intent Slots list, under the SLOT TYPE column, select RoomName from the dropdown list. For Slot Values, add the following values one at a time. Click the button in the text box each time you add the value. For Sample Utterances, add the following sample utterances. You do not need to use the Select an Existing Slot pop up. Simply click the button in the text box each time you add the utterance. Scroll down to the Intent Slots section. In the Intent Slots section, under the SLOT TYPE column, select Activity from the dropdown list. On the left side navigation pane, click JSON Editor and review the code to validate that there are no errors. Note: The Skill Builder will do syntax checking to ensure the JSON is well formed. Click Build Model at the top. Note: The Build Model icon changes to a processing icon. In the meantime, you may proceed to the next section. In this section, you will create the Lambda function to power your Alexa skill. Click Open Console found to the left side of these instructions. At the top right corner of the AWS Management Console, make sure that the region is US East (N. Virginia). 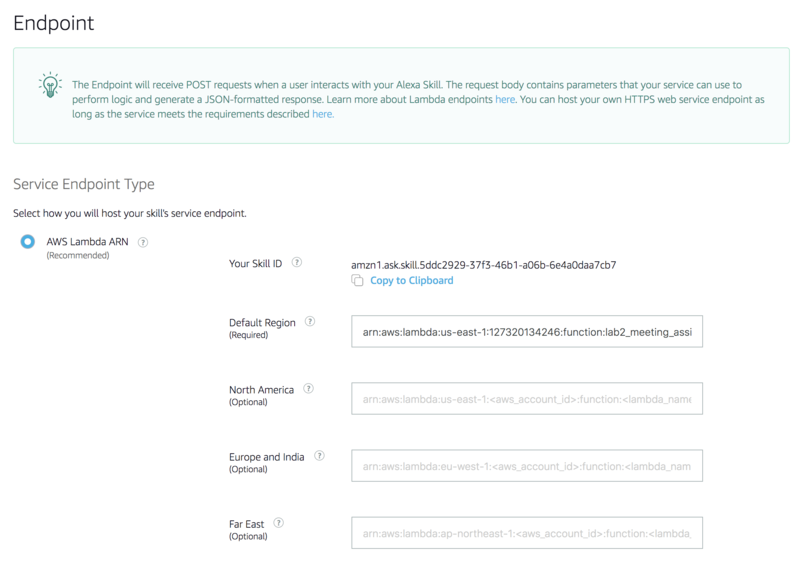 In the AWS Management Console, click Services, then click Lambda to open the Lambda dashboard. At the top of the screen, copy the Lambda function ARN to your text editor. Code for the AWS Lambda backing the Alexa skill. Handler for all events - This is the central intent controller, determining how each intent is routed. "Hi Alexa, please ask Bootcamp Assistant if this floor has a registration"
Checks when a given activity is occuring using a pre-defined table. speech_output = "I was unable to understand what activity you were referring to"
Specific skill intent, checking the existence of a room. intents, this will be done with DynamoDB. speech_output = "I was unable to understand which point of interest you were referring to"
speech_output = "Yes, " + room['speech'] + " is on this floor"
speech_output = "Hello, I cannot find that room on this floor"
speech_output = "I do not see a device with that id registered in your interested group"
:param should_end_session: Should this end the session? Scroll to the top of the screen and expand Designer. In the Add triggers list, click Alexa Skills Kit. Click Add at the bottom right corner. You may ignore the error below, if you see it. For the purpose of this lab, you are not setting the Skill ID verification to Enable. Go back to the Alexa Developer Console. You should see the Bootcamp Assistant skill you just created. In the left side navigation pane, click Endpoint. Select the AWS Lambda ARN option. In the AWS Lambda ARN option, for Default Region, type the task1_meeting_assistant Lambda ARN you made a note of in an earlier step. At the top of the screen, click Save Endpoints. On the top menu bar of the Alexa Developer Console, click Test. Toggle the Test is disabled for this skill button to ON to turn on the tests. It should now show Test is enabled for this skill. Press ENTER on your keyboard. You should hear Alexa's response. 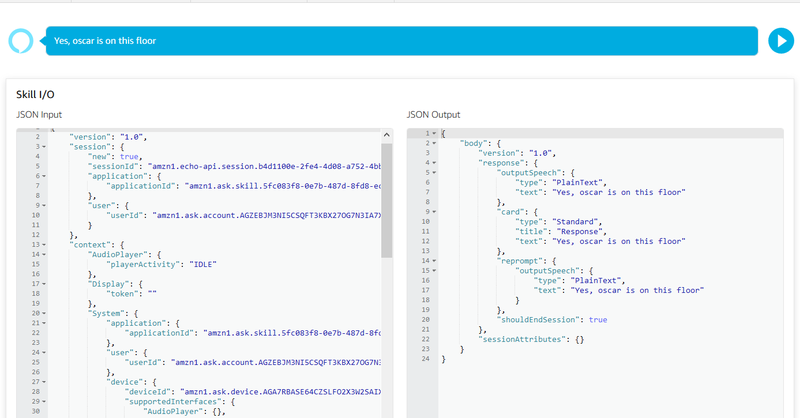 You can see the request JSON on the left, and the response JSON on the right. They should look similar to the image below. Type the second question from the list and press ENTER again to hear Alexa's response. You can also click the blue colored play icon to listen to the JSON response. In the AWS Management Console, go to the Lambda dashboard and open the task1_meeting_assistant Lambda function. Scroll down to the function code and review the function code to understand how intents are being handled. Look at the def on_intent(intent_request, session) function. This is the main intent handler. This function is handling two intents. The first intent, CheckRoom, is the intent you created in the Alexa Developer Console to check for the existence of a meeting room. The second intent, WhenActivity, is the intent which tells you the time when breakfast/lunch is served. Look at the def check_room_existence(intent, session): function definition. In the check_room_existence function, you define a list of allowed rooms and check if the RoomName is in the list. Look at the def check_when_activity(intent, session): function definition. Similar to the previous function, you set up a dictionary of activities (for example, lunch) along with start and end times. If the user asks for an activity, the function returns the start and end time for that activity. You have successfully completed Task 1 of the lab!